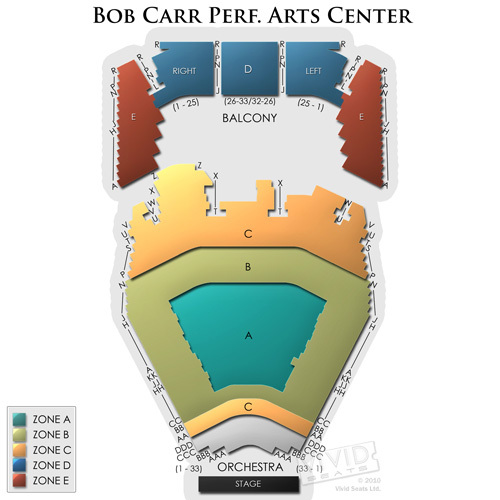 The Bob Carr Performing Arts Center has a comfortable seating capacity of 2,518, don’t be fooled by its cosy size, the center is one of the premier music establishments in the Orlando Area. Whatever the occasion, their are seating options for any preference. Check out the handy seating chart below to plan where you want to sit. The seating chart illustrates five separate zones, at the rear of the Center patrons can select balcony seating, offering a great view of the entire theater, and a birds eye view of the performers. In front of the balcony areas zone B, A and C are all seating areas situated on floor level. The Orchestra section is located at the front. Zone C is closes patrons can get to the stage, for those who like getting up close and personal with the performers. Their are accessible seating options available at this venue, for more information please contact Bob Carr Performing Arts Center directly, using the number on the contact page.